Hi crafty friends! I thought I would take a moment to share a card I made using the lovely Mediterranean Moments stamp set from Stampin' Up! I've had this one for awhile, but hadn't decided what I wanted to do with it. This was my 1st time cracking the box open and I absolutely love the images. I only stamped one so far, but it stamped beautiful, detailed and crisp lines despite how fine they were. Stamping' Up! really has impressive quality with their rubber stamps. I decided to stamp the image in black ink and then do a watercolor wash of ink. That was the fun part! I loved blending the ink in layers to add deepness, shading and variations to the color. It's so fun and easy. I did take my time though, and let it dry in between layers so that when I added more ink it gave depth. When I was finished I was wishing I could sit awhile on the bench and drink in all the atmosphere this image brings. When it was time to figure out how I was going to make my painted images into cards...well, that was the tougher problem. They were busy and colorful enough that using a patterned paper was going to be distracting, and yet, I thought the solid card stocks were a little too dull. I compromised and did some light stamping on the background card and a layer of the new designer paper Color Theory. 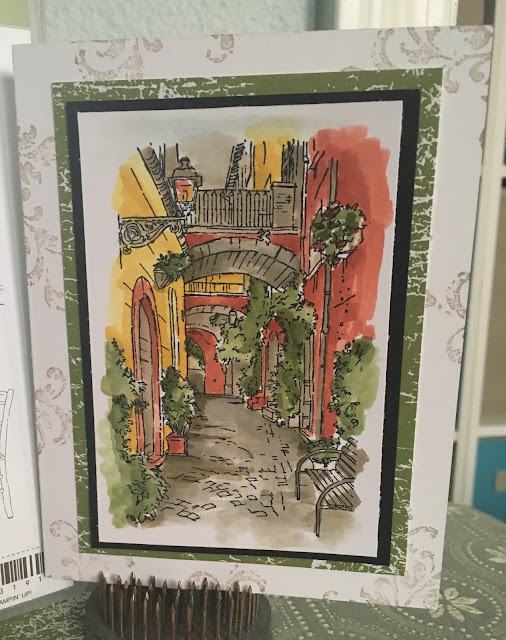 I decided that a sentiment on the outside of the card wasn't necessary and may add one inside later, but even without that, it really does have a fun artsy look to it. I am looking forward to playing with the other images in the set as well. I like your blog, looks like you have put a lot of effort in it. I will be trying these crafts soon hope they turn out good.